At home, a rare sight, 2 squirrels sharing the feeder. 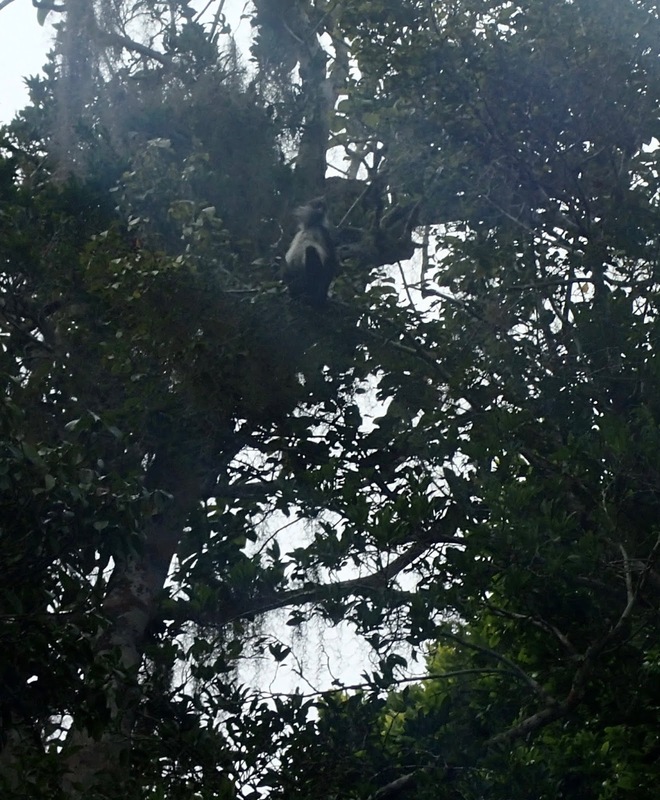 Away (sorry I took my little camera so you may have to look hard) a spider monkey. Spider monkeys roam free in Canada? That is so cool! wow, I have only seen monkeys in parks/zoos. Squirrels are so clever...and aggravating at the same time. I don't mind feeding them but dang they turn into such piggies. We have a yard full of clever squirrels. LIttle brats is what they are. ISomething's skewed about the grammar in that sentence. Trying it again: Little brats are what they is. No, that doesn't work either.) Anyway, we are going to Costa Rica in a few weeks and the guidebook says we'll be seeing spider monkeys. I'm sure the birds stay far away from that feeder. We hope those tree rats leave some seeds for the birds. We can see the monkey just fine too. We finally gave in and got squirrel proof feeders. If they put any weight on the feeding platform it triggers the openings for seed to close. I make sure they have some peanuts every morning though. Wow - a spider monkey!!!! You must have had an amazing trip! OMD, I'd luv to bark em! I'd be out there barking at those rotten squirrels. We have birdie feeders that close the feeding ports when a heavier bird or squirrel sits on it. Our Evil Squirrel Cartel has yet to figure them out! Haha! Was that little monkey up in a tree in your yard? Pierre would love to help bark at your squirrels but might freak out over a spider monkey! BOL! Ooooooooo! I gots this.....WOOOOOOOOOFWOOOOOFWOOOOOOOFWOOOOOOOOOFWOOOOFWOOFWOOF!!!!! Are they gone??? glads to help out! pees: Ma had to read the description for the second pic twice...she thought you suddenly had an invasion of Spider Monkeys in Canada! BOL!!! Wow, that monkey's soooo very cool. I wonder the squirrels we have are closely related.